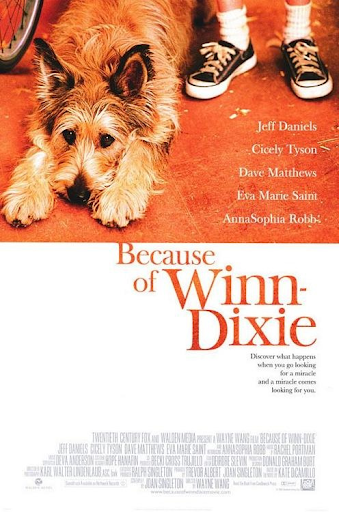 Just watched Because of Winn Dixie with Olly and the we'ans... and absolutely loved it. I don't want to spoil the story for anyone who hasn't seen it... and I bet most of you reading this haven't seen it. Suffice to say... Winn Dixie... the dog... is a bringer-togetherer. Winn Dixie inspires Opal... the wee lassie played by AnnaSophia Robb... to bring together a completely disparate group of people... to share the joy they are missing. There is such a spirit of unconditional love... both from Winn Dixie and from Opal. There is a real sense of acceptance of where people are at NOW and not where the WERE. The characters are disparate... each with their baggage... but when they come into contact with Winn Dixie and Opal they shine. They shine due to the unconditional love. Both Winn Dixie and Opal reach out. They reach out because they are lonely but also because they recognise their lonliness in the lives of the people they encounter. In doing so... they connect with the people they reach out to... sharing stories and times in their lives. It doesn't end there, however, in that they connect the folks together with each other too. Winn Dixie & Opal become "hubs" that connect all the individual spokes together into the wheel. They are bringer-togetherers. The "church" as experienced by "The Preacher" (the character played by the fab Jeff Daniels) is twofold - the one he works at (very "one-to-many" with him on the platform) and the one he participates in at the end of the film. Something organic grows from the unconditional love... something starts where the group (who are brought together by Winn Dixie & Opal) come together in the home of Gloria Dump (the blind recovering alcoholic) to share the joy... and its a beautiful sight to witness. Nobody was in charge. Nobody was on a platform. I could go as far as saying it was a great example of an emerging organic church... with the people coming together in Gloria's house... not Opal or the Preacher's. It was a beautiful film... one that I am glad to have watched. It has inspire me and refreshed me. Thanks to all involved for making such a fab film. The soundtrack is brilliant too with the likes of the Be Good Tanyas, Leigh Nash and Shawn Colvin. Super chilled and atmospheric Americana... lovely!